The MIC2012 is a dual channel USB power switch designed to support the power distribution requirements for USB Wakeup from the ACPI S3 state. The MIC2012 will directly switch its two outputs between a 5V main supply and a 5V auxiliary supply normally provided in ATX style power supplies. 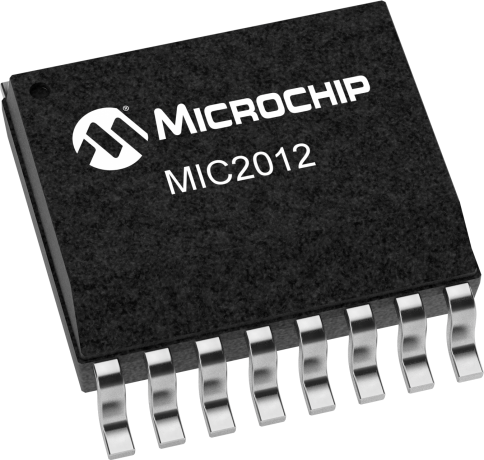 The MIC2012 will adjust its current-limit threshold according to the ACPI state it is in. In the normal active S0 state the current- limit is set at 500mA minimum per channel satisfying the USB continuous output current specifi cation. In the S3 state the current-limit can be reduced to only 100mA per channel to minimize the current that is supplied by the auxiliary supply thereby ensuring that voltage regulation is maintained even during fault conditions. The MIC2012 provides make-before-break switching to ensure glitch-free transitions between the S3 and S0 states. Each channel is also thermally isolated from the other so that a fault in one channel does not effect the other. FAULT status output signals are also provided indicating overcurrent and thermal shutdown conditions. The MIC2072 option latches the output off upon detecting an overcurrent condition for more than 5ms minimum. The output can be reset by either toggling the EN inputs of the MIC2072-1, -2 or by removing the load. Latching the output off provides a circuit breaker mode of operation which reduces power consumption during fault conditions.